BlinkM MaxM is BlinkMs bigger, crazy sibling. 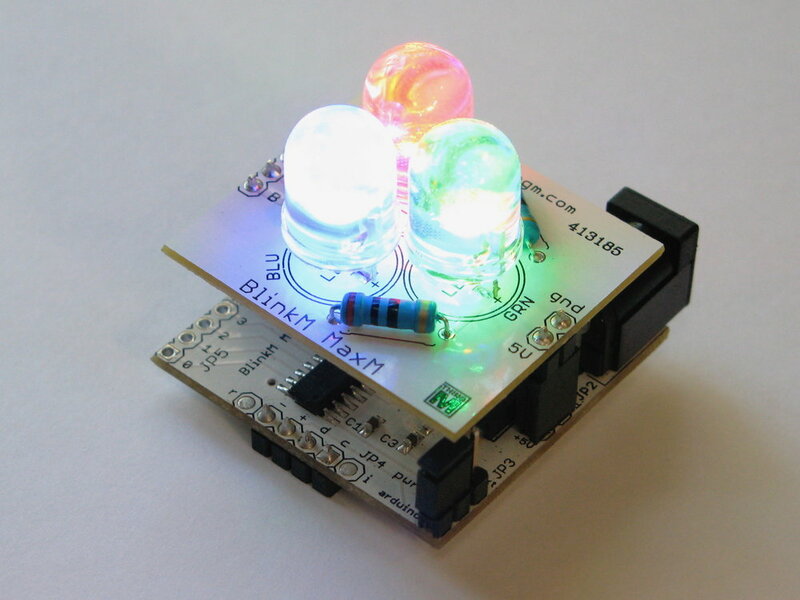 It’s an intensely-bright smart LED that comes as a package of two components, a control module (MaxM Master) and a daughter board with three ultrabright LEDs (MaxM Blaster). MaxM Master runs our unique firmware that creates virtually any RGB color, fades smoothly between two colors, and blinks in virtually any pattern (it can flash like a police light, for example, or flicker like a candle). Like its smaller sibling, it lets you do all of that without having to know any electronics engineering or programming. BlinkM Sequencer–our free Open Source sequencing software runs on most operating systems–makes it easy to select any RGB color or pattern and instantly upload it to BlinkM MaxM (we also provide Java, C, and Processing libraries and programming examples for using it). BlinkM MaxM’s powerful 3 amp MOSFET transistors can drive power-hungry ultrabright LEDs, or large numbers of LEDs simultaneously (such as found in LED strips). Its 5-24 volt power supply allows it to be run from a wide variety of common power sources, making it perfect for prototyping automotive applications and low-voltage track lighting systems. MaxM Blaster’s trio of LEDs is 50 times as bright as a standard BlinkM and more than 1000 times as bright as a standard LED. They’re so intensely bright they kind of freak us out (and should absolutely not be looked at directly, under any circumstances!). Finally, it includes four 8-bit analog input lines, which means that its behavior can be changed without requiring an external controller. All existing BlinkM software should run on the MaxM without requiring any changes.